Dr. Marianne Fracica, owner of The Cocalico Cat and Gingham Dog Animal Hospital is a native New Yorker who transferred to Lancaster County in 1994 to practice small animal medicine and surgery. Dr. Marianne knew at age five that she wanted to be a veterinarian and throughout her lifetime never had any doubt that this profession was her calling in life. She completed her undergraduate studies as a Biology major at CUNY-Brooklyn College. She attended Mississippi State University College of Veterinary Medicine where she earned her Doctor of Veterinary Medicine degree in 1992 and graduated at the top of her class. Dr. Fracica has twenty-two years of experience as a practicing clinician. She particularly enjoys working up both canine and feline challenging medical cases. In addition to her canine and feline patients, she enjoys working with rabbits and pocket pets. In addition, she is a USDA certified veterinarian. Marianne continues to enjoy her career and could not envision herself doing anything other than veterinary medicine. She is a member of the American Veterinary Medical Association and The International Veterinary Medical Association. She resides on a farmette in West Cocalico Township with her Daughter Victoria and menagerie of farm animals including a pony, miniature donkeys, sheep, rabbits, chickens, cats, and dogs. Cindy Savino is our Office Manager and wears many hats. She is the person responsible for the smooth running of our practice. Originally from New York, Cindy left behind a legal career and moved to the area in 1996. Motivated by her lifelong love of animals and the offer of a “part-time” job, she joined our staff in 2010 She currently resides in Reinholds with her husband Lou, daughter Annmarie, 2 dogs and 3 cats. Colleen is the head veterinary technician here at Cocalico Cat. She resides in West Cocalico Township with her husband Jamie. She received her degree in Ag Business from Harrisburg Area Community College. She has always had a desire to help animals. In her free time, she enjoys raising and showing rabbits and poultry. She also enjoys spending time with her English Mastiff Hercules, Redbone Coonhound Chief, and her three cats Zeus, Hubba, and Doug. One of her greatest accomplishments was helping to start up the Rag’s to Rabbits 4-H Club, which meets in Denver PA.
Brooke is a veterinary assistant at the Cocalico Cat. She recently graduated from Cocalico High School and resides in Reamstown. Brooke received her veterinary training at the Lancaster County Career and Technology Center. She has always had a love for animals. When not working, you will find her taking care of her many animals, or spending time with her “human” family. Linda is a native New Yorker who grew up on Long Island where she obtained her degree as a Certified Veterinary Technician. She has over 30 years of experience as a veterinary technician and Humane League Shelter Manager. In her spare time she enjoys all things outdoors, especially hiking and kayaking. She resides in Akron where she shares her home with Jack Russell Terrier, Tucquan. Rhonda is our exceptional morning receptionist. She is literally sunshine in a bottle! She is a native of Western PA but followed her high school sweetheart, now husband, Doug, to the Lancaster-Lebanon area for work and boy are we glad she did. Rhonda is always ready to greet you with a smile and immediately puts everyone at ease. She is a German shepherd lover but tolerates our office cats who do their best to convert her to a feline fancier. Tammy is a native Lancastrian. She has over 15 years of experience as a veterinary receptionist. Tammy is passionate about everything equine and owns and trains racehorses in her spare time. She resides in Ephrata with her husband Alan and dog Reese. Victoria is the daughter of Dr. Marianne Fracica and has grown up in the veterinary hospital. She lives on a farm and has spent many years as a 4-H member. She is currently a sophomore in college and fills in occasionally in reception. 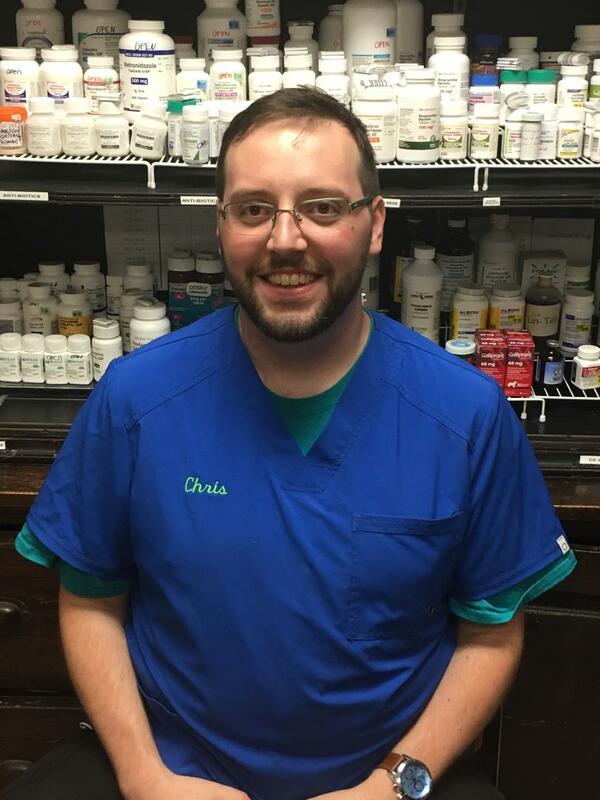 Chris is a Certified Veterinary Technician at Cocalico Cat & Gingham Dog Animal Hospital. He graduated from YTI’s Veterinary Technician program earning his CVT degree. Prior to his studies at YTI, Chris earned an Associates Degree in General Science from Landmark College. Before working in practice, Chris was strictly a “dog person” but his many feline patients have changed his purrspective as a feline fancier. He loves working with animals and hopes to go back to college to become a Veterinarian himself. 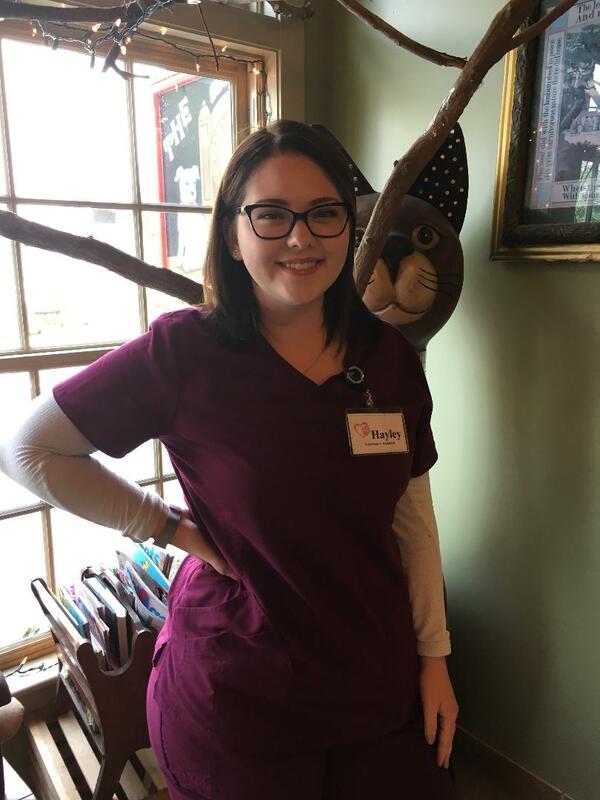 Hayley is a Veterinary Assistant here at the Cocalico Cat & Gingham Dog Animal Hospital. She recently graduated from Cocalico High School and attended Lancaster Career and Technology Center in the Veterinary Assistant program. She is currently working towards her Veterinary Technician degree. Hayley resides in Reinholds with her family, including her six “four” legged family members. When not working, you can find Hayley drinking Starbucks while getting lost in a good book.